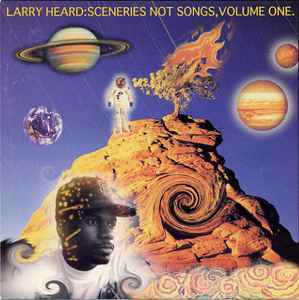 Larry Heard ‎– Sceneries Not Songs, Volume One. Dolphin Dream is just on another level. One of the best ....WOW..
reissue please . . . . . . . . . When is the 180 gram 2xLP remastered re-issue coming? Clone are you out there? Would love to see an vinyl repress of this. Alleviated Records? i purchased a copy of this on the understanding it was the japan issue from a seller turned out it was a CD-R with a red silkscreen with no trace of the titles just a false bar code and dodgy artwork the original version is glass mastered and manufactured by Nimbus in with a Blue silkscreen also the frequency is also cut to 16khz very strange for 1994 i wonder if it was mastered like that in 1994? Larry Heard most introspective and sublime release. Although there might be better individual songs whether for the dance floor flor for the lounge chair I cherish this cd the most. I had gotten this back in 2005 before the re-release came out for a good penny. When music is this good money isnt really a problem with me. Tracks like Tahiti Dask just go on and on and nobody questions why. Snowcaps might be my favorite Larry Heard track of all time. Or Summertime Breeze might be one of his most poignant pieces of music. Excellent island disk of yesteryear. Larry Heard shocked the dance music community when he released this 1993 LP/CD comprised mostly of deep and jazzy atmospheric music rather than deep house stompers. It wasn't really a big departure from his emotive deep house sound, but this record found Heard delving even deeper into his jazz, fusion, and early 80s R&B roots, while putting the typical house music forms to the background. This is mostly a record to sit and listen to than to dance to, and it alienated some who were expecting another 4 on the floor house album from the creator of deep house. Nevertheless, it has gained respect over the years as an artistic masterpiece, and even warranted a cd re-release in 2006.
wow, no comment. What a priceless LP of music from the legendary Larry Heard. A complete album of beautiful and simple melodies, electronic deepness personified, and a rare record to boot. Almost like an earlier 'Alien' LP, this solid release should be a staple ingredient in any discerning electronic buyers collection, there's not a bad minute on here, which is rare for a full album in anybody's book, but this is Larry Heard we are talking about. Buy on sight.